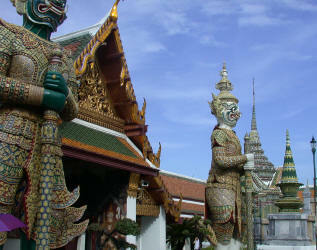 We arrived in Bangkok late at night on December 9th, after 17 hours in an airplane from SFO-Narita-Bangkok. 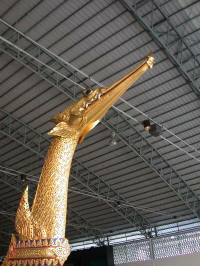 We did a lot of reading. 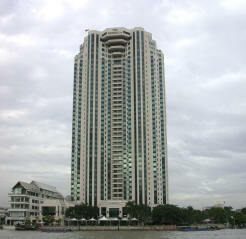 The recently opened Peninsula Hotel was the site of our first night in Thailand. 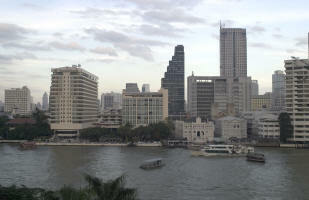 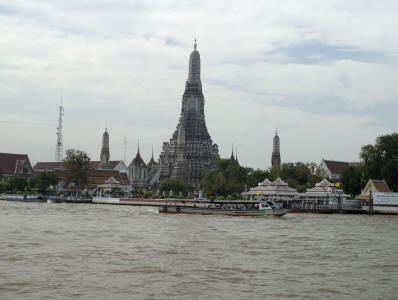 From our room we had an unobstructed view of the Mae Nam Chao Phraya River, the navigational heart of the city. 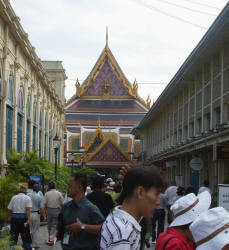 After a quick view of our surroundings and a shower, we crashed for a good night's sleep. 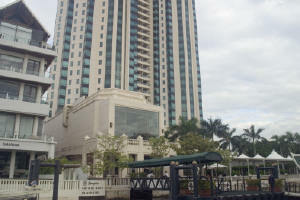 In the "City of Angels" once an orchard for olives and wild plums, the river serves as the hub of the city: transportation, shipping, commerce. 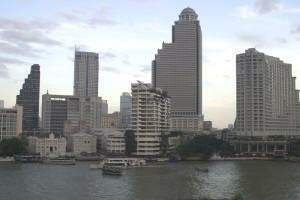 Bangkok is a relatively new city and it is experiencing all the growth pains of fishing village to major metropolis. 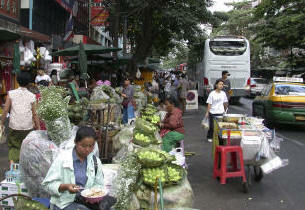 Since it was a holiday during our visit, we did not see the daily road gridlock. 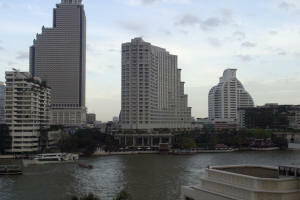 During this time of year the temperatures are moderate and the air quality is relatively clear. 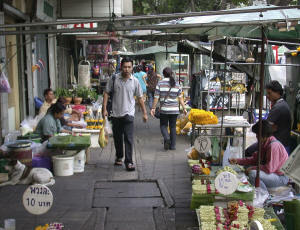 The flavor of the city is reminiscent of Hong Kong, Singapore, Shanghai and Guangzhou. 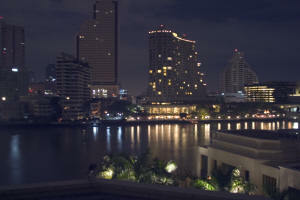 Wed. Dec 10. 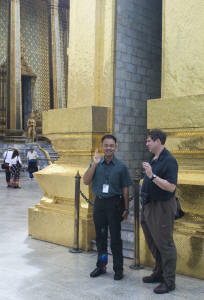 Our guide, Mr. Chumpan met us early in the morning and outlined our day's itinerary. 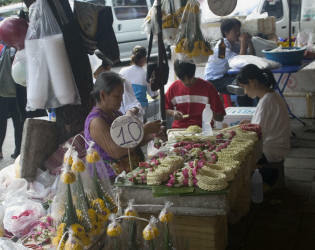 Without delay we boarded a ferry (river bus) and took off up river to the flower market which was very busy due to the holiday. 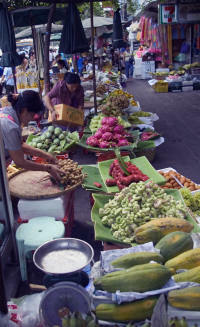 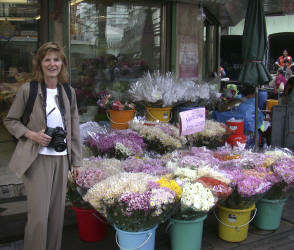 In addition to the flowers, the markets were packed with vegetables, exotic fruits (9 types of bananas), dried fish, betel-nuts, and incense. 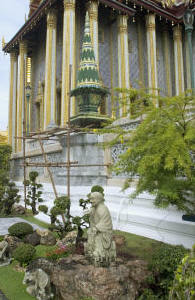 The jasmine and marigolds are used in the Buddhist temples and shrines. 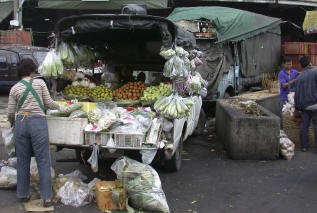 The markets flow from store to sidewalk to street to back of vehicles. 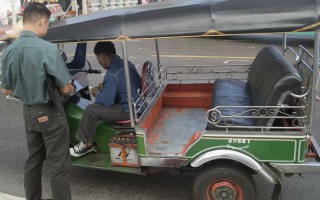 We grab a tuk tuk (golf cart with an engine) and motor over to the Grand Palace. 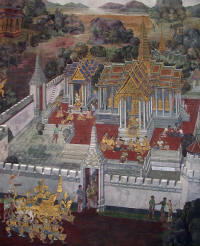 In 1782, King Rama I built the walled city containing sovereign and religious buildings which served as the official residence of the monarchs. 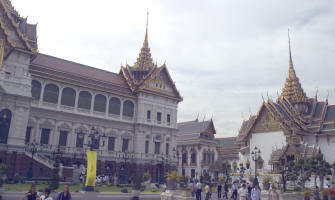 Although Thailand has a constitutional monarchy today (1932), the grounds are still used for major royal ceremonies and international meetings. 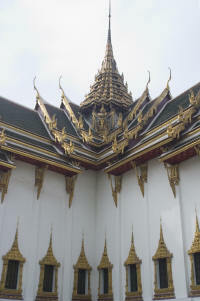 We tour the Royal Chapel, Wat Phra Kaeo, which attests to the major role of Buddhism for the Thai people. 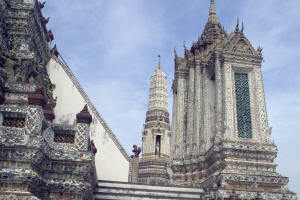 The sheer fantasy of the gilded monuments, ornate gabled soaring roofs and decorated pediments, ceramic tiles, floral motifs and painted murals contribute to the stylized Thai architecture. 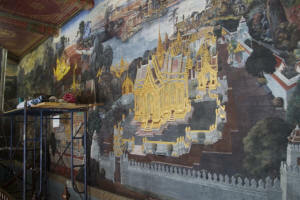 Pavilions and cloister galleries use 178 murals to depict stories of an Indian epic with accompanying poetry. 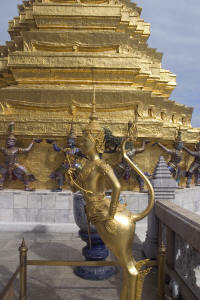 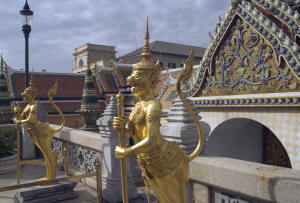 The upper terrace affords views of the Wat and includes the fabulous mythical creatures composed of bird, serpent, human body parts. 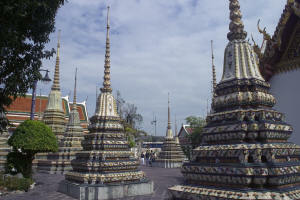 The sacred Buddhist scriptures are housed in the Mondop. 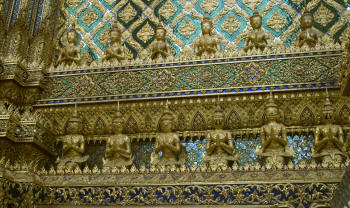 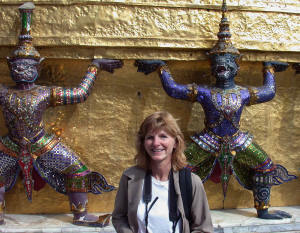 Pictured below with the gilded statues (not Jon) are the mother-of-pearl and ebony entry. 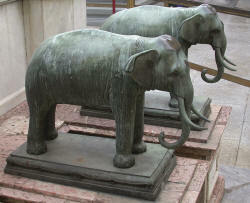 Outside are the monuments dedicated to the sacred white elephants. 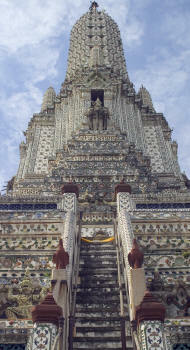 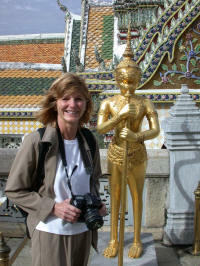 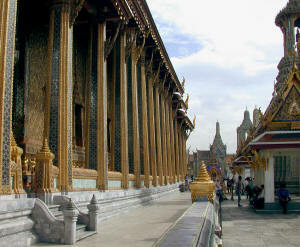 Ubosot: The Royal Monastery of the Emerald Buddha is the crowning jewel of the compound. 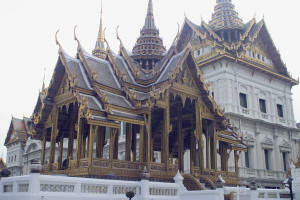 However photographs are not permitted inside so there are no pictures of the golden cape draping the jade Buddha atop a traditional Thai throne made of gilded carved wood. 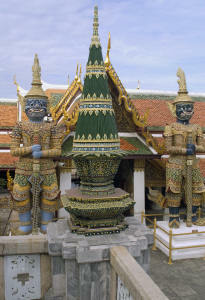 Externally a frieze of garudas and nagas run along the walls with lion figures guarding the entrance. 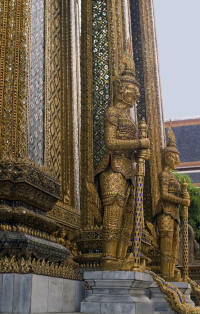 Demons of glass mosaic surround the gilded towers guarding the entrance to the Royal Pantheon. 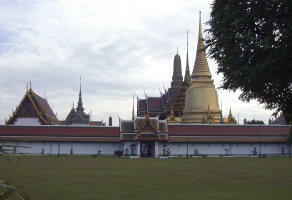 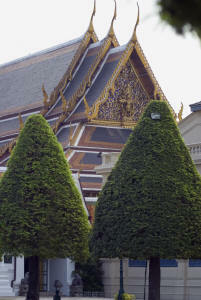 Upon leaving the Wat area, the Palace Buildings including the Grand Palace, are at the heart of the compound. 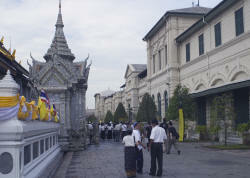 In a gated area to the right of the Grand Palace is the Boromabiman, a more modern palace now serving as a residence for foreign dignitaries as Clinton and Carter. 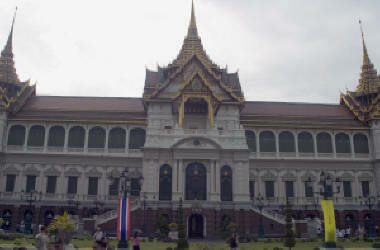 The Chakri Mahaprasat, English architect, is a neo-Classical building with a Thai-style roofline built in 1882 by King Rama V. It is used primarily today as a reception hall for foreign ambassadors and state banquets. 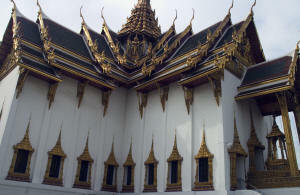 The Dusit Group below consists of the Dusit Maha Prasat Throne Hall and the Amphorn Phimok Pavilion. 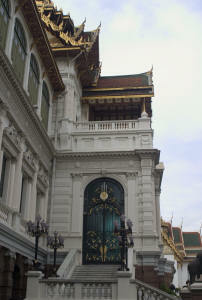 The Throne Hall built by King Rama I is principally used for lying -in-state of royalty and honored family. 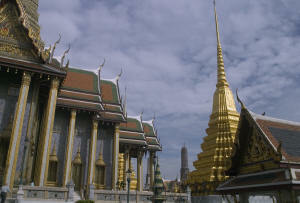 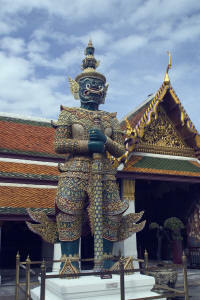 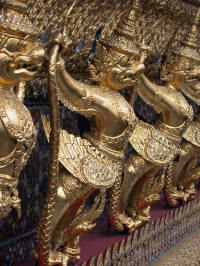 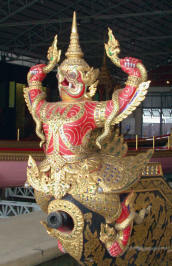 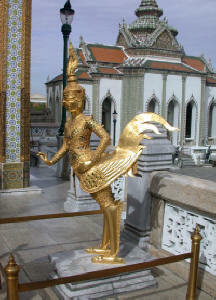 South of the Grand Palace is Wat Po, established in the 16th Century and the oldest temple in Bangkok. 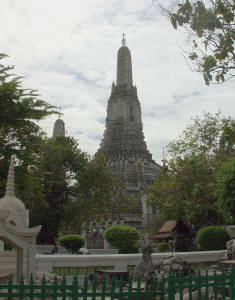 The compound includes the monument area and a monastic quarters. 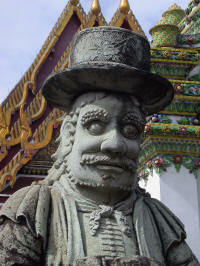 In addition to statues of demons and animals, huge hat-wearing stone figures guard the grounds. 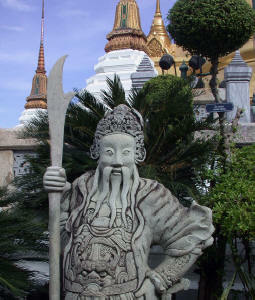 The Chinese stone figures were originally used as ballast for ships in the rice trade. 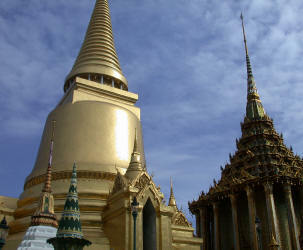 Rama III initiated education in the role of the temple. 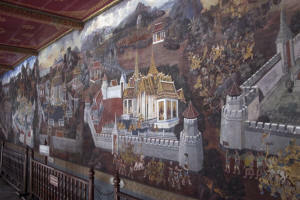 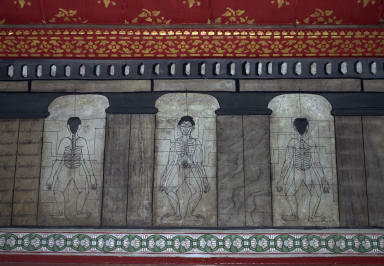 As part of the open university, the walls have murals depicting various subject matter: geology, literature, yoga positions for relaxation, massage techniques and prescription remedies. 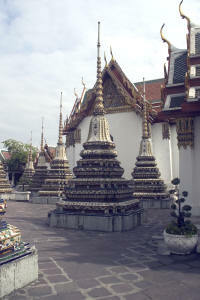 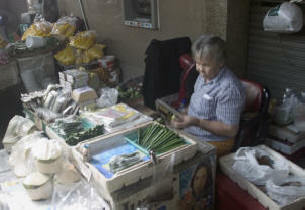 The temple remains a center for traditional medicine. 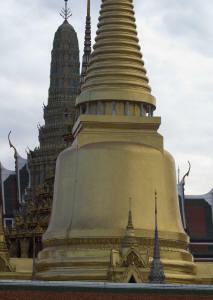 Within the grounds of Wat Po, the Temple of the Reclining Buddha was built by King Rama III and remains the largest wat in Bangkok. 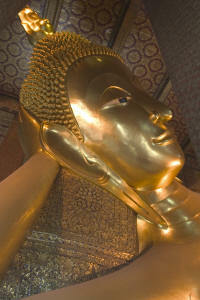 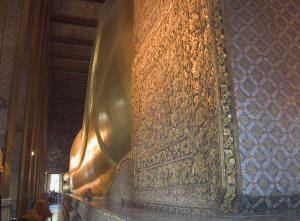 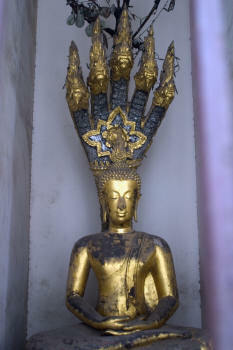 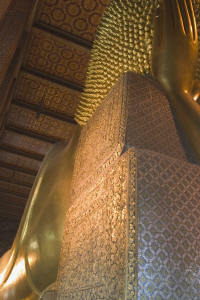 Inside is a 150 foot gilded reclining figure of Buddha reaching nirvana. 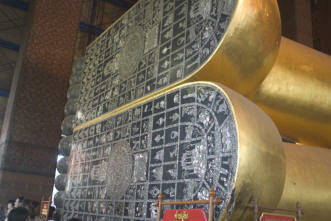 The 10 foot feet of the Buddha include 108 signs of the Buddha inlaid in mother-of-pearl. 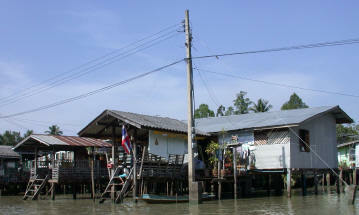 We took a ferry to the Supatra River House, where we had our first complete Thai meal in country. 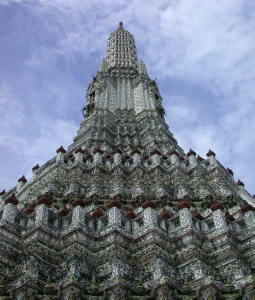 After lunch, we visited Wat Arun, the Temple of Dawn, where the Emerald Buddha was originally housed. 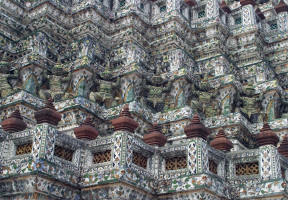 The temple follows the Chinese style of porcelain mosaics in flower arrangements covering the walls. 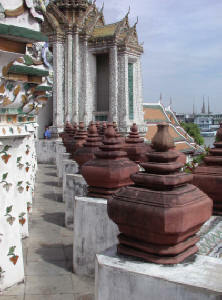 Although the steps are steep, the views are worth the climb. 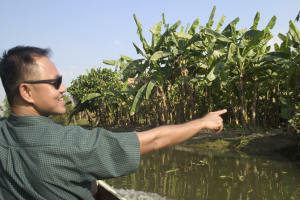 We next took a public ferry to the end of the river line at Northaburi. 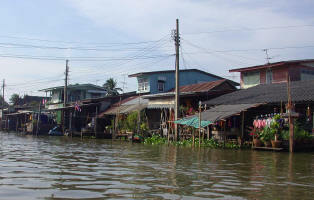 Then we climbed into a long-tail boat (named from its extra long propeller shaft extending beyond the stern) and for the next few hours we motored the canals through suburban neighborhoods of Bangkok. 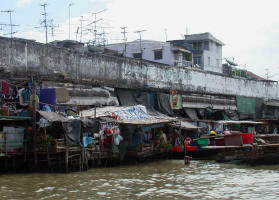 People were using the water for bathing and swimming. 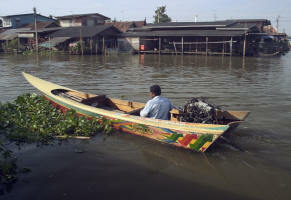 There was a constant stream of vendors in boats moving along the river selling groceries, cooked food and supplies. 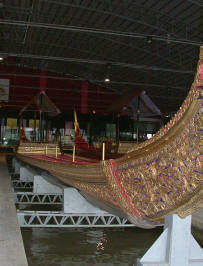 Our last stop was the Royal Barge Museum. 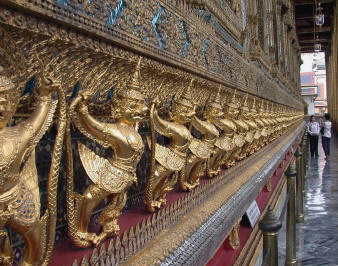 Since the kings used their barges for royal events and entertaining visiting dignitaries, they are gilded and brightly colored with creatures carved on the prows. 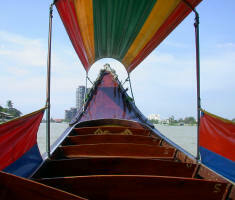 Today the barges are still used for major celebrations. 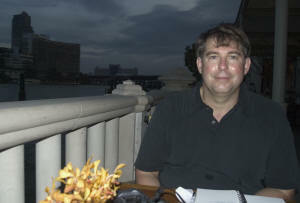 Prior to dinner we sat on the Peninsula terrace comparing notes from the day's adventure.